The Quadrantid meteor shower is active 1—6 January each year, but there is a narrow window of opportunity in which to see it at its best since the peak activity lasts just a few hours. The maximum is predicted to occur at 8am GMT on 4 January. While this is in bright twilight for the UK, a second prediction from meteor dynamicist Jérémie Vaubaillon suggests a Quadrantid peak some hours earlier. This graphic therefore depicts the UK sky high to the south at 6am GMT on 4 January when the shower’s radiant will lie close to the zenith forming a right-angle with the familiar seven stars of the “Plough,” or Ursa Major overhead and Arcturus in the constellation Boötes to the southeast. For scale, the view is about 90 degrees wide, or almost five spans of an outstretched hand held at arm’s length. AN graphic by Ade Ashford. 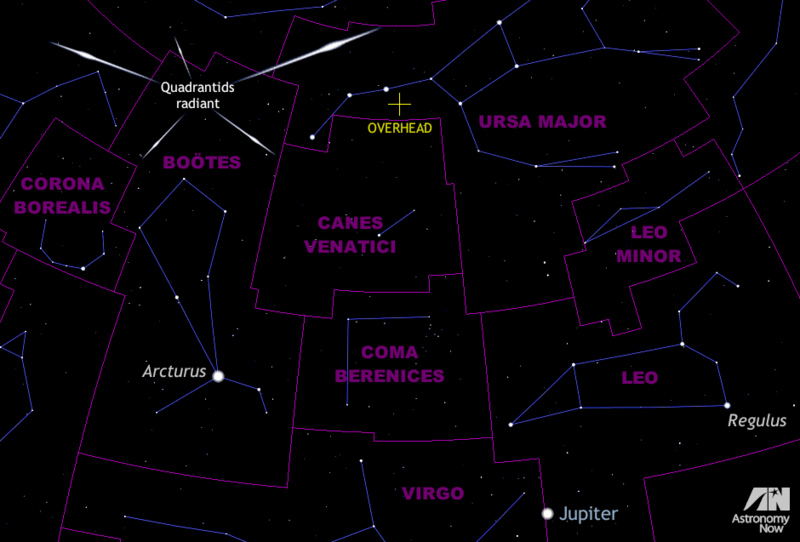 The first major annual meteor shower is the Quadrantids. In common with other showers, it is named after the constellation in which the radiant — the point in the sky from which the meteors appear to originate — resides, but you won’t find Quadrans on any contemporary star chart. Now sadly defunct, Quadrans Muralis (the mural quadrant) was created by Jérôme Lalande in 1795 and occupied the space between our present day constellations of Boötes and Draco. For its 1—6 January duration, the Quadrantid radiant lies in northern Boötes. The Quadrantids have the potential to put on an impressive display rivalling that of the August Perseids or the December Geminids, with figures of 60 to 120 meteors per hour often quoted. Quadrantids are slow to medium speed entering the Earth’s atmosphere with velocities of around 43 kilometres (27 miles) per second, with brighter examples often appearing yellow and blue. About ten percent of these will leave persistent glowing trails, too. So why is it such an underobserved shower? The problem lies in the fact that most of the peak activity occurs within a six-hour window centred on a short, sharp maximum. The International Meteor Organisation (IMO) predicts that the shower will peak at 8am GMT on Monday, 4 January. With sunrise occurring at 8:28am GMT for the centre of the British Isles on this date, the sky will therefore be in bright twilight for much of the UK. If this main prediction holds true, then North America might get the best show. However, a second prediction from meteor dynamicist Jérémie Vaubaillon suggests that the Quadrantid peak will arrive some hours earlier, which will certainly favour Western Europe. For UK observers, the best time to mount your vigil might be between 3am and 6am GMT on 4 January. A 24-day-old waning crescent Moon just four degrees to the lower left of planet Mars in Virgo rises at 2:20am GMT on 4 January as seen from the centre of the British Isles, but it shouldn’t detract too much from the brighter meteors that one might see. The faintest meteors are the most plentiful, so to maximise your chances you should find a safe location that is as far removed from streetlights and other sources of light pollution as you can and allow your eyes to become fully dark adapted. Ensure that you are dressed in multiple layers of clothing with warm boots or shoes, gloves and — particularly important — a hat, since a large proportion of heat is otherwise lost through the head. A thermos flask of your favourite hot beverage and a lounger chair is a good idea as you’ll be still for long periods during your watch. Observing in company is always more fun too! Don’t concentrate on the radiant but at a point about 40 degrees (or twice the span of an outstretched hand at arm’s length) to one side of it and about half way from the horizon to overhead. The source of the Quadrantids is most likely a small solar system body known as (196256) 2003 EH1 that was discovered in March 2003. It completes a circuit of the Sun every 5.52 years in a highly inclined, eccentric orbit and last came to perihelion in March 2014. Most likely an extinct comet, 2003 EH1 could be related to the break-up of Comet C/1490 Y1 that was observed by Chinese, Japanese and Korean astronomers 525 years ago. Find out more about what’s up in the night sky in the January 2016 edition of Astronomy Now. Never miss an issue by subscribing to the UK’s biggest astronomy magazine. Also available for iPad/iPhone and Android devices. 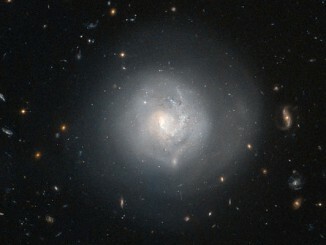 Markarian 820, also known as Mrk 820, LEDA 52404 or IRAS F14379+3142, is a lenticular galaxy in the constellation Boötes, about 300 million light-years from Earth. Galaxies like this one are in the transition zone between ellipticals and spirals and lie right where the fork divides in American astronomer Edwin Hubble’s classification scheme of galaxies from 1926. 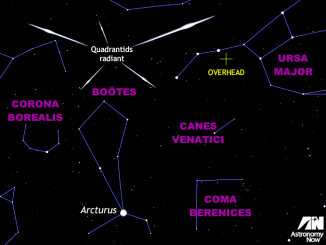 It’s time to direct your attention skyward for some celestial pyrotechnics from the first major annual meteor shower — the Quadrantids. The short-lived peak of this active shower is predicted to occur at 2pm GMT on 3 January, favouring observers in the west of North America, but most Northern Hemisphere observers with clear skies will still see some shooting stars. 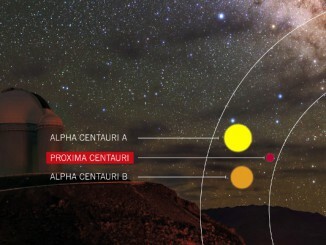 Pale Red Dot is an international search for an Earth-like exoplanet around the closest star to us, Proxima Centauri. It will be one of the few outreach campaigns allowing the general public to witness the scientific process of data acquisition in modern observatories via blog posts and social media updates. The Pale Red Dot campaign will run from January to April 2016.